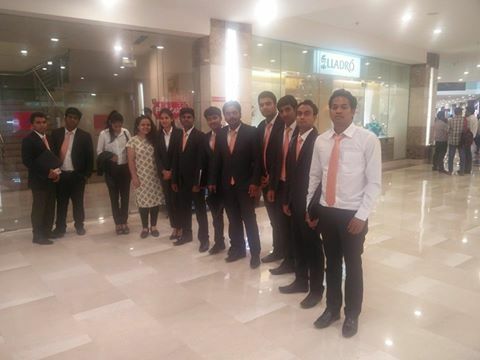 INLEAD recently facilitated an Industry Visit for the International Business Management students of Jul’16 batch to Ambience Mall, NH8, Gurgaon, in order to provide them a greater understanding Organised Retail, Mall Management and Zoning of stores in a Mall. The mall is spread over 13 lakh square feet of space, and is often known as the 1 Km Mall. Ambience is a large real estate group with diverse realty interest like luxury residence, commercial towers and organized retail. The visit to Ambience Mall, Gurgaon commenced around 3:30 pm, when the students where first asked to get a feel of the mall by just loitering around. Around 3:45 pm they were taken around the mall by the Mall Manager who started his tour from Gate No.1, also known as Zara atrium. He then took them for a guided tour across all floors, explaining to them in great detail the layout of the mall and the zoning of stores. They were made aware of the popularity of Mango store and therefore the naming of the frontage around the store as Mango atrium. Thereafter they were guided across different floors, and explained the unique aspect in each floor and the major anchor stores that help bring footfalls into the Mall.